Your primary objective is to destroy the Sansha's Nation battle station. Clearing the area of hostile forces should decloak the Nation's ore refinery. Mine the local Lyavite asteroids and transport the ore to the refinery. The chain reaction caused by refining the explosive ore will tear the battle station apart. Sansha's Nation has established semi-mobile mining colonies to aid in the harvesting of ore. Due to the unique nature of these operations, which incorporate new mining technologies and hundreds of willing miner slaves, the daily amount of ore extracted from these operations would be sufficient for the replacement of hundreds of battleships. DED's conclusion is that these mining operations are a primary method of supplying the new Nation fleets with replacement vessels. Further complicating matters is the demonstrated capability of this colony to disrupt local system-wide services. The exact nature of this technology is unknown, but appears to be dependent upon first establishing a system-wide presence. If the Sansha can be removed quickly, their potential impact upon the affected systems will be limited. Synopsis from ISHAEKA-0071. DED Special Operations. Below is a list of enemies that spawn in this site. See Sansha's Manual for a full list of the incursion rats. If you mine the Lyavite, the list of potential ships is expanded. Everytime you pull ore from the asteroid, there is a chance of a new spawn containing these new or a combination of these and some of the frigates above. ^ While using their propulsion module, they suffer the same signature bloom as players. ^ This is the speed of the ship while they try to get within orbit or as they try to chase after you, suffering the same signature bloom as players do with the propulsion module on. They will turn off any propulsion modules once they get close to their preferred orbit. ^ Preferred orbit range and regular speed while orbiting, which is their regular speed without the propulsion module turned on. ^ Damage per second as well as damage per volley. Unless stated otherwise, turrets do an equal amount of EM and thermal damage while torpedoes do an equal amount of kinetic and explosive damage. ^ This is the effective range of this ship, presented with two values for turrets, optimal and optimal + double falloff, as well as a single range for torpedoes. ^ This is the amount of damage this ship can take, taking into account their resists. All ships, except the Lirsautton Parichaya have omni tanks. Hover over the icon for information about raw hitpoints. This is a generic kill order that works no matter what fleet you're running. Certain special doctrines or fleet compositions could change some things in order to optimize their fleet efficiency, so this isn't necessarily the only kill order, but it works. As a general rule of thumb, if you cannot shoot the highest priority target due to low damage projection, move on to the next target you can actually hit. Just remember to switch back to a higher priority target if it moves into range later on. 1 Niarja Myelen Because the Niarja Myelen jams and neuts. Mara Paleo The Tama warp disrupts and you remove a lot of damage quickly by shooting them first. The Mara is a high priority targets because it remote repairs the other ships. 3 Auga Hypophysis Schmaeel Medulla The Auga warp disrupts, webs and does more damage and is easier to kill than the Romi. The Schmaeel because it both warp disrupts and webs, with the web being a potential problem for speed-tanking logistics. 4 Romi Thalamus Eystur Rhomben Neither Romis nor Eysturs pose any real threat, although multiple Romis will keep the incoming dps high for a while. ^ These targets are usually larger, cruisers or battleships and suitable for ships with good damage projection, lower tracking, like battleships with large guns. ^ Smaller targets, like frigates or extremely fast or small cruisers. Ideally the primary targets for strategic cruisers, Vindicators or the dronebunny as a last resort. The last enemy killed triggers the next wave, so there is no risk of accidentally triggering the next wave before you finish your current one. Mining ore from the Lyavite asteroid will trigger additional spawns. This site requires 255 units of a special ore called Lyavite. Requires a range of 65km to effectively hit the Mara Paleo. In order to complete this site you will need Lyavite which can be mined from a special asteroid in the site itself or simply brought in with you in the cargo hold for faster site completion. The asteroid with the Lyavite is about 60km away from where you land in the site, which coupled with the fact that you would need mining drones, mining lasers or strip miners to get the ore out of the asteroid, all incursion communities have stopped mining the ore in the site and simply buy it off the market or acquire it themselves from level 2 mining missions. See Ore runner for more details on this role. When it's time to run the ore, which is usually at the start of the third wave, find the refinery itself which is located on the right of the big Sanshas Battletower. The bracket to aim for is the left side of the refinery, called Asteroid Colony. For simplicity, you can use "Keep at range ..." at 1,000 meters. The refinery won't be interactable until all the enemies have been cleared from the field. This will trigger the refinery and spawn a can called "Nation Ore Refinery" close to the Asteroid Colony. When you drop the ore into the Nation Ore Refinery the unstable ore will explode when reprocessed and cause a chain reaction destroying the battletower, finishing your objective. While it's not critical to fleet safety to be able to hit the Mara Paleo out at 65km (can sometimes be as close at 52-54km if you're at the other end of the warp-in), it will be required to spawn the second wave. 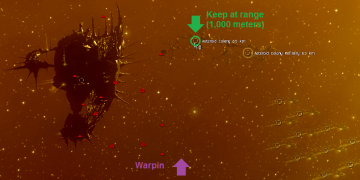 So if you find yourself unable to kill the Mara, you can always kill the warp disrupting Schmaeel Medullas and abandon the site. There are three waves in this site, identifiable by the Mara Paleo in the first wave, the lack of any Auga Hypophysis in the second and the reappearance of the Auga for the third and final wave. Waves spawn roughly 70 - 75km away from the beacon, although the Sansha will rapidly close the distance to their preferred orbit. The different waves are slightly randomised. The same type of ships will spawn in each wave, but the number of each is randomised. This page was last modified on 29 July 2017, at 10:47.